This week is all about jazzing up your home. I specifically cover a few ideas for three rooms and I’ve kept the ideas generally low cost. A lot of things can be found on low price sites like Wayfair or eBay. Also, don’t underestimate being able to find what you need at second-hand stores. You can often find gorgeous furniture that may just need a bit of work to make your own. You can find oodles of inspiration on Pinterest for things. I always head over there to find out if I can get some inspiration before starting. Most importantly though, make your home yours as much as your bank account will cooperate with you. Personalizing your space does not need to be pricey, small things can add a much needed personal touch. Ah, the bedroom, where you spend about a third of your time sleeping (hopefully). Given given that, it’s essential to design your bedroom to facilitate sleep. Of all the rooms in your house, your bedroom should be the room you feel the most comfortable in. Painting is relatively inexpensive, and a fresh coat of paint can immediately change a room. The best color? Your favorite, your bedroom should be your retreat so it’s important to choose a color that you’ll love. Greens and blues are my favorite colors as they have a wide variety of shades that will suit your decor. Dark colored walls can work, but I recommend picking some lighter pieces for the furniture or wall art to break up the intense hues. Pick pieces that relax you or make you happy. For instance, I love New York City (I love it even more after visiting it a few years ago) so I have a few canvas prints of cityscapes. If you like Paris, throw some Paris up on your walls! I love natural wood looks, ways to instantly dress up a plain old bed is to design your headboard! Make it your own. The Art In Life has a fantastic rundown of types to check out, my favorite has to be the one using the shutters. The living room is often your first impression of a home, it’s where you might come after a long day at work and kick off your shoes and watch some television or surf the internet. It should be a room that you feel comfortable in! I like a beautiful light grey (or similar light and neutral tone). Your taste is going to change over time, so unless you’re willing to paint every time you decide to go for something different, it’s easier to work around picking a relatively muted color and putting personality into things that are easier to change, like throw pillows on the sofa or drapes. The “farmhouse” trend is huge right now, I quite like it myself. Mainly because it’s based around natural and neutral coloring which flatters almost any space. I love natural looking woods and they are so easy to dress up a little with pops of color. Heck, you can even make a coffee table yourself (My favorite design is from Handmade Heaven), if you’re fairly decent with some tools or know someone who is. It would also be nothing to create end tables and even a console table that matches the design as well. It’s your space, don’t feel like you have to buy an already made product unless you see it in the store and fall in love with it! I typically like to match things like throw pillows with the curtains, it’s not necessary to match material or the color accurately. I often will have a solid color on the window covering, but choose a complimentary pattern for the throw pillows or the area rug. I love the idea of adding some natural plants, particularly if your living room is south facing and gets a lot of light (but you can quickly pick plants that need less light if you have a north facing living room). They compliment a natural look. Plus they purify your air which is always a good thing! It can be hard to do a kitchen, mainly if you lack enough funding to change the main parts, like the cabinets or appliances, but here are some tricks to enhance your kitchen space without the costly renovation! Nothing can add immediate pizazz to your kitchen than a new window covering, especially if you are lucky and have large windows in your kitchen area, a new window covering will immediately anchor the eye when coming into the kitchen. 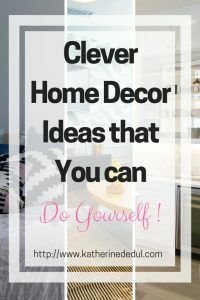 These, as it turns out from my research for cheap Kitchen DIY projects, are quite simple to make and you can customize them to suit your existing decor. My favorite is from Grillo Designs, it’s so simple, and you can find hooks at your local hardware store that will suit if not outright match your existing cupboard hardware. Don’t underestimate the power of adding a centerpiece to your kitchen table or island. A nice bowl of real fruit (I’ve personally never been a fan of the fake stuff) or a vase with some fresh or fake flowers in it can add some life to a dull kitchen set up. For example, I’m loving the “starburst” style of fruit bowls. There are millions of ideas on Pinterest that can inspire you to customize your space and make it yours. There isn’t a “right” or “wrong” way to decorate, just make your space YOURS! We don’t get to pick the aesthetics of, say, our work environment if you work outside of your home, but we do get to decide how we want our personal spaces to be. My recommendation is to start small, pick a few key pieces and see how they feel to you. Going all out is both pricey and can overwhelm a space (particularly smaller ones). So there you have it, my simple tips for customizing your personal space. I hope you liked it. If so, let me know in the comments or share this post to social media using your favorite platform. Join me next week when I outline my favorite Christmas Decor Ideas. Until then, happy crafting! Fantastic ideas … enjoyed it… this piece of writing is really useful to me… Thanks and keep sharing. These tips are really inspiring me take action, love all of your tips. Waiting for more tips like these. Roy Jason recently posted…Life Changing New Year’s Resolution Ideas That Anyone Can Stick To.